Tim Ball is Anthony Watts' pet conspiracy theorist. He's an utter nutter of the first order. He was the first-named author of a book denying the greenhouse effect (pictured right). Anthony Watts never mentions that, although he has a policy that "WUWT is a slayer free zone". Anthony only implements this policy on very rare occasions, and always exempts Tim Ball. Today I'll just write about one thing, and it's not about Tim's main preoccupation (anti-semitic conspiracy theories). This time it's about manipulation. Manipulation is a curious word. It sends shivers down the spine of every science denier yet they flock to blogs like WUWT where manipulation of the gullible is the only stock in trade. 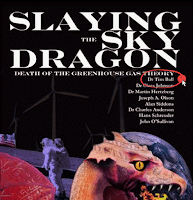 The Intergovernmental Panel on Climate Change (IPCC) and the people who formulated the structure that directed their research, constantly manipulated the data and the methods to predetermine the results. The first thing to wonder is how thousands and thousands of multiple generations of scientists all over the world managed to conspire to get results that point to the same conclusion: we are causing global warming. That has to be the biggest super duper conspiracy ever, doesn't it. Tim doesn't say how this works, but he doesn't have to. His fans are all conspiracy theorists too, and believe that everyone is out to get them. Oh, except for Donald Trump who can do no wrong even when he's hurting them very badly. The second thing you might wonder about is this bit about manipulating the data. If you're a scientist, you know that working with oodles of data requires one to process them. Manipulating data is what scientists do. What they don't do, unless they are dishonest, is "manipulate data and methods to predetermine the results". Anyone who does that is eventually found out and the result is not pretty. The major difficulty with the records is that the number of observations and the time of observation varied considerably. So what did he do? He manipulated the data, using "adjustment factors". My oh my. That sounds just the sort of thing of which he doesn't approve. Adjustment factors were calculated for all of the combinations using a modern record maintained at the Churchill airport. Using modern temperature records from an airport? An airport, I tell you, where UHI disease is rife. 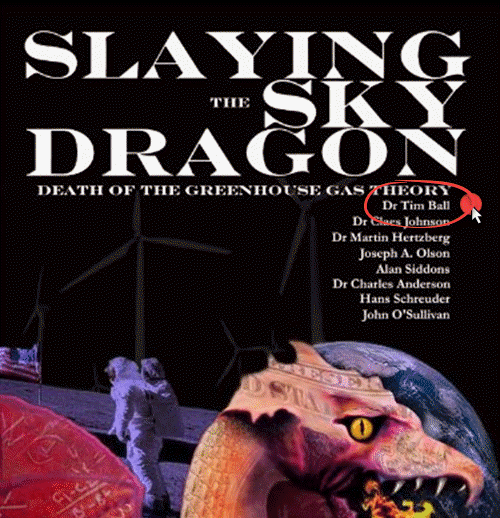 If deniers knew that, they'd never forgive Tim Ball. By combining the Hudson's Bay Company record with data recorded by members of the Royal Canadian Mounted Police after 1852, and up to 1910, a long and relatively continuous record of daily and monthly average temperatures has been created for Central Canada. Wow! What do you reckon. How can Tim hold his head up among the paranoid conspiracy crowd? Not only did he manipulate the data, he spliced records of two factories with records from the RCMP (which surely are part of the elite swampy establishment about to take over the world). Just thought you'd like to know that Tim Ball, possibly before he descended into utter nutter conspiracy land, briefly worked with temperature records, splicing and dicing them. I won't bother with the rest of his article. It's just Tim moaning to WUWT-ers that CO2 isn't really increasing because, despite all the evidence showing CO2 is increasing, climate science is a hoax. Or something like that. That's mixed in with all sorts of his usual nasty conspiratorial thoughts about scientists who still do science. Thank you Dr Ball. I always read carefully all your articles. You are my go-to source for learning about 1)the science of climate and 2)the politics of the climate-change-scam. Thanks for digging up that Ball publication! I'm shocked...shocked, I say! Reading the article, Tim Ball is clearly homogenising his data to be able to make better estimates of the observed warming. He also explains the various changes in the measurement methods that make the homogenisation necessary. The main one being the changes in the time of observation. "The value of these records lies primarily in providing absolute measures of temperatures in central North America at the critical period of transition from the apparent termination of the Little Ice Age into the warmer modern era." Connedspiracy Theory does not require any proof or evidence to be considered true. In fact, just the opposite represents "truth". Because you can't find proof of Connedspiracy Theory that would pass any kind of reasonable fact check - this is considered "the proof" that Connedspiracy Theory must be true! I wrote a series of articles on this ridiculous thought process (or lack thereof) and why connedspiracy theory is the bastion of idiots, morons, stupidstitious fools and whatnot. I didn't pull any punches and still don't. Connedspiracy theory is what fuels the "alternative" reality / news cycle on a constant basis. It's like a shot of cold water being dumped over your head - you'll need a daily dose of this to stay "awake" and "informed" to the "truth about our world". Despite the vast majority of their claims being utterly false, dishonest and highly selective of their alleged "facts", the historical record shows that their connedspiracies are almost always false. But it does sell a lot of useless unnecessary products and gain website visitors. I recently got contacted by TimeBomb2000 - the old connedspiracy forum for the Y2K scare. It was a fund-raising request. I spent a few hours researching the site and examining their current articles and comments. Connedspiracy theory is alive and well (including climate change denial). But so is rampant racism, xenophobia, stupidstition, conjecture, straw "arguments" and absolute utterly ridiculous commentary from grossly uninformed participants. The connedspiracy theorists relish uninformed debate, illogical arguments and claims and lack of evidence. Facts are unnecessary. Counter-arguments are undesirable. Group-think and blind obedience to asinine claims is expected. Because of these characteristics, you do not find relevant arguments or facts being presented, they're not even desired in such places. These websites operate in a vacuum of self-fulfilling paranoia and prediction. Adherents scour the news for only what fits their preconceived filters for "truth". What you're left with is a bastion of stupidity and ignorance, reinforced by daily updates of outrageous denial and disbelief of the real world, poisoned by stupidstitions and wrong-headed thinking. Anthony Watt's website is exactly like this. I do not bother engaging, reading or stopping by to read anything there because it's the same regurgitated utter nonsense found all over the Stupid Net now. These people have abdicated all critical thought processes and have elected to promote absolute garbage that defies reality, science and facts in their quest to gain attention, readership, money and advertising revenues. They reject reality and live in an alternate universe of their own creation. They want you to join their dwindling numbers. It's not a place where I want to be. It's a dangerous delusional step away from reality. It's destroyed thousand of lives and will undoubtedly destroy more. I've made an earnest attempt to pick up the pieces of some of the shattered lives that have been affected by such websites and disinformation outlets. It is an enormous amount of work, but rewarding to see someone get their life and thought process back to reality. "Y2K scare"? I don't know about "scare" but Y2K was real unlike all Conspiracy Theories. Concerning AGW it's not all that complicated, some people like following Conspiracy Theories as a type of hobby. A strange hobby... but just a hobby. The rest well I suspect it is just confirmation bias, and an appalling lack of intellectual honesty. And some are just downright dishonest, what some call "bad faith actors". I run into this mob all the time in anti-vaccines, anti-GMO, anti-Evolution etc. They have a not-so-hidden agenda.